Rolling your R’s can be difficult especially for a bilingual kid. Uncertain on how to help my little one I reached out to a group of wonderful mamas from Multicultural Kid Blogs for some tips, and suggestions. This is called “rotacismo” and it is very common. There are great exercises to help with rotacismo. My favorite one is pretending to make the sound of the car: RRRRRum RRRRRum. (I bet he would enjoy playing cars with you!) Oh, and I also had the same challenge when I was his age. I’d replace my rr’s with d’s. I remember I couldn’t say “perro.” It was super embarrasing! Isolating the sound is much better than having him do tongue-twisters with a sound he cannot pronounce. Also, many native speakers can’t pronounce this sound until 5 or so. He will get it. Apparently it’s the hardest sound to pronounce- my 6 yo can’t do it either… apparently Polish kids only learn it at around 8 yo! However, we’re working with a Polish speech therapist who’s working on her rolled R’s and other sounds as well. Tell your students to repeat that several times and to pay attention to where their tongue hits the roof of their mouth. If they will practice doing that then just push air over the tongue when they get to the double “tt” they can learn to do it. It does take practice though. No one says “butter” with a hard [t]. We say it with soft [d] so words with “dd” work too: fodder, ladder, etc. 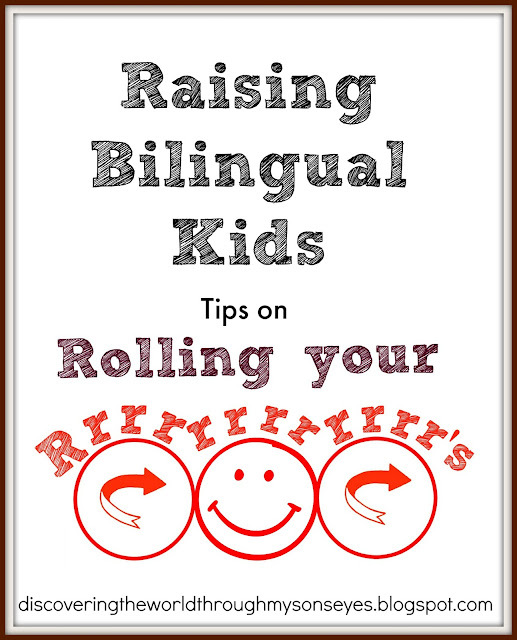 I hope that helps!” If you ever have students that have trouble trilling the rr, just tell them to say the phrase “put it away” over and over again as fast as they can…usually their tongue will naturally do it and they can at least see that it is possible. This trick has worked for many students…I have no idea who taught me this, but I have used it forever. Sing the William Tell Overture with the sound of the letter D. It builds muscles in your tongue and really helps. Another phrase that will produce the simple r is “pot of tea” said quickly. The simple and rolled r are different though. Does he pronounce his d’s in Spanish the right way? You can try having him say “Pedro” over and over and over and over and it will train his tongue to roll his rr’s. The ‘dr’ combo is the motion your tongue makes on the roof of the mouth when you roll your r’s. My 8 year old still has that problem!! But some trabalenguas can help him!! Just do it in casual ways. My 9-year-old had similar experience last year. Then she said that her Spanish teacher told her just relax and practice the “r” for fun. So I joined the practice with her when she wanted to. I am still having problem but my girl suddenly did it one day when we were doing the practice lying down. According to my daughter “lying down and practicing” helped her to get to where she is now. We have the same with Russian R which is very similar to Spanish. So far my 7 year old says D or Y (as in yo) instead. And the 3 year old says L instead. I love this thread!! I had a Portuguese friend teach me how to roll my tongue when I was about 8 and I’m so thankful she did! But I had no clue how to teach my kids. So glad to read all these tips! You got plenty of useful advice here, so I won’t add more. Exercicing the “d” or “l” first and other alveolar helps a lot. Have a look at The Alveolar Consonants. Here is an interesting article about this too: Articulatory Difficulties in the Acquisition of Spanish /r/ in a Bilingual Context. By the way: /r/, /R/ and /l/ are causing articulatory problems in other romance languages, too (like Italian and its dialects). Have him practice “R con R Cigarro, r con r barril rapido corren los carros por el ferrocarril.” They made me say that over and over again. Erre con R cigarro, R con R barril, rápido ruedan los carros cargados de azúcar del ferrocarril. As Diana we said it for fun as kids and later in life I learned from my speech therapist friend this is used for real in therapy. Now, Cordelia from Multilingual Mama didn’t share much of tip but since she has such witty sense of humor this is what she had to say. I can’t roll my RRRS. it breaks my heart. I have spent years trying. even had a spanish teacher who specialized in that try to get me to roll them. I am sure it isn’t too late for him and I don’t have any Latin blood in me just married to it but if I had a genie in a bottle, I do think rolling my RRR’s might be one of my wishes! These are the suggestions from these awesome mamas from across the globe. Do you have any tips or ideas? If you do please share! Hello Terry! I like that one "Put it in" I'm pretty sure my son will get a kick out of saying it really fast. Thanks for sharing! Is rolling the r that difficult? never thought of it! I was a multilingual from the start so I can pronounce anything, but my 4 year old cant pronounce many hindi letters! we make him say funny things & send audio files to our families back home!